Navigating the world of blogging income can be confusing, but once you learn how to earn money from your blog, you'll regret that you didn't pursue it earlier. 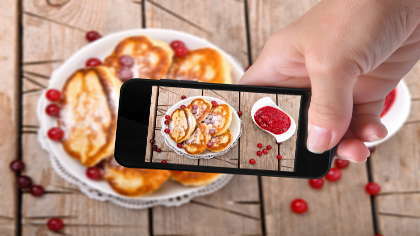 A food blog is a beautiful and fun way to earn an extra income, but it takes a lot of work. So many food bloggers find themselves ready to take the next step in monetizing, but feel overwhelmed with where to start. The most important first step is to make a plan. Here are 5 ways to start making money from your blog today. As a blogger, you are now a member of the press, which means brands value you and want to speak to your customers. One way they can do that is by placing advertisements (pictures or video) on your blog. The up side is that once the ads are up, you will earn money from them while you sleep! The down side? You must have a large audience for ads to be worth it. Most companies and ad agencies will pay "per click" (if a reader clicks on the ad) or "per impression" (if a reader views the page containing the ad). If you feel ads could work for your blog and you have some coding experience, consider reaching out to your favorite brands directly. Otherwise most bloggers choose to join an ad network. Once you are accepted, the network takes care of placing the ads and negotiating with the brands. A few popular ad networks are Google AdSense, BlogHer, PlateFull and Federated Media Publishing. An affiliate shares someone else's product and is compensated for each sale. Many bloggers recommend their favorite photography courses, blogging courses, cookware, etc. If you have found a course or product you love, ask the company if they offer an affiliate program. For example, Amazon.com offers an affiliate program where you can imbed a store into your blog and make money any time someone purchases an item from your blog. Because brands now understand the influence that bloggers have, they want to be in front of readers more. One way they accomplish that is by paying bloggers to write an entire post or social media share about their product. A simple way to pursue sponsored posts is by reaching out to brands via a Twitter message saying you are a long-time fan and interested in discussing sponsored posts. Network marketing companies have been around for decades, and bloggers are starting to incorporate them into their monetization plan. Once you join a network marketing company, you can feature the products on your blog much like an affiliate program, but earn much more. Many network marketing companies offer a 30% commission on your sales. Think about how many skills you have learned by starting your own food blog - recipe development, food photography, online marketing, search engine optimization, etc. Your blog now serves as your portfolio and will be very helpful when you reach out to organizations. I now have my own column in our local parenting magazine, having only my blog as a reference.